While I had out the Magical Messages from the Fairies Oracle Cards (Doreen Virtue PhD) to do my daily reading, I decided to ask the fairies for some guidance about what my blog should be about this week. This is the card that appeared. Any discussion about healing is close to my heart, because it was a healing course which led me to my interest in all things spiritual and my decision to become a writer. I had been reading a book by Melissa Hocking, called A Healing Initiation: Recognise the Healer Within, when I discovered that Melissa would shortly be holding a weekend course in Brisbane. After experiencing some amazing miracles whilst reading the book, I naturally couldn’t resist enrolling for the course. Whilst many people have heard of Reiki these days, until I read Melissa’s book, I had never heard of any sort of energy healing. I was fascinated to learn from the book that this form of energy healing, called the Quantum Bioenergetic Balancing Technique, merely puts the body back into balance, and allows the body to heal itself. The first miracle I experienced happened while I was practising using the frequencies. Of course, feeling the frequencies running in your hands for the first time is a miracle in itself. But my first real miracle happened when I was practising using the frequencies on myself. I had been meditating, when I requested proof that the healing frequencies described in the book really did work. When I got up from the bed on which I had been meditating, I had an excruciating pain in my back. This wasn’t the sort of proof I had been looking for. I had been looking for positive proof, not negative proof. I found that lying flat on the floor was the only position in which I found any relief, but I was still experiencing excruciating pain. I practised the healing technique on myself, and when I arose from the floor, the pain had gone. As I walked up the hallway, I realised that my gait had changed. Previously I had dragged one foot, almost imperceptibly. Now, I seemed to be walking with an even gait. What I later realised was that the slight curve in my spine had straightened. When we experience miracles, we tend to allow our logical minds to explain them away. The next miracle, however, was even harder to deny. One day when I was driving myself to work, I started feeling a tingling feeling in my hands, which I realised was the frequencies beginning to work. As I drove closer to work, the feeling in my hands got stronger and stronger. The tingling had turned to throbbing, and I had to alternate my hands on the steering wheel, because I couldn’t bear to hold on for any length of time. As my hands began to throb, I also began to feel faint. It got so bad, it took all of my concerted effort to hold my head upright. I was beginning to become very disconcerted. I know I had asked for proof that the frequencies were real, but did it have to happen while I was driving? Then I saw it. On the other side of road, up ahead, there appeared an ambulance. As my car slowly approached the ambulance, all of my attention was drawn to that vehicle. There may have been an accident. Perhaps a police car. But I was not aware of anything apart from that ambulance, and the effect that it seemed to be having on my body. As I approached the ambulance, the throbbing and faint feeling seemed to magnify in intensity. I wondered what I should do – whether I should stop. But then I remembered that the book had told me that these frequencies work from a distance, so I knew that I didn’t need to stop for the healing frequencies to do their work. Whenever my mind creates doubts about the truth of energy healing, I take my mind back to that ambulance and its effects on me. Naturally, after experiencing these miracles, I was looking forward to the course. As an adjunct to the course, they also carried out energy attunement procedures, called Axial Initiations, during which, some people experience remarkable changes. The woman who conducted my Axial Initiation told me that, after her Axial Initiation, she became psychic, being able to see and hear beings from spiritual realms, such as angels, and deceased loved ones. During my Axial Initiation, I learned that my role in life was to be a writer, and that I had angels and spirit guides waiting to talk to me, and deceased loved ones standing by to cheer me on. Since that day I never looked back. I followed the guidance which I received, and learned to talk to angels and spirit guides, and even deceased loved ones. It was not too long after that healing course, that I started writing my first book: Getting Used to Weird: Getting Used to Love, in which I tell about all the weird things that happened to Angela, the character in my books. Funnily enough, her experiences have pretty much mirrored my own. If you have the chance to learn an energy healing method, I wouldn’t hesitate to do it. Whilst the opportunity to learn about Quantum Bioenergetics may not come along too often, there is another form of energy healing which works just as well, if not better, called Quantum Touch. Quantum Touch can be learned from an easy-to-follow book. This method of healing uses those same frequencies, which flow through every living thing, to heal the body, but involves the breath and toning to increase the power of the frequencies, whilst focusing the power through the hands into the patient’s body. Many people have had great results from Reiki, as well. 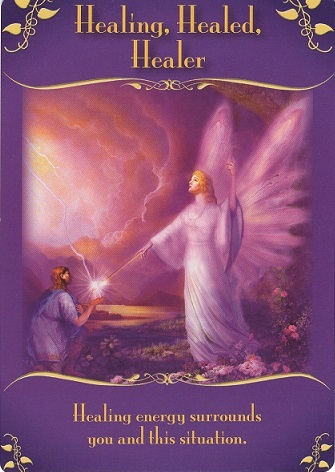 The card from the Magical Messages from the Fairies is letting you know that you, too, can be healed. You, too, can be a healer. Ask and you shall receive. Have you experienced or heard about any healing miracles? I would love to hear about them.